09 Apr What’s Fresh for Spring? Posted at 14:50h in food, healthy living, nutrition by Justin G.
We all know that April showers bring May flowers, but did you know they also bring new in-season fruits and vegetables? It’s true! Eating seasonal produce is not only beneficial to your Instagram (hellooo colorful salads and smoothies), but they also have a higher nutrition profile and even taste better. Foods that are in-season are often grown locally and are harvested at their peak. When fruits and vegetables are grown out of season, they often travel long distances to reach your grocery store, and therefore are harvested before they are actually ripe to keep them from spoiling in the time it takes to reach your refrigerator. This means they miss out on precious natural ripening time that boosts the produce’s flavor and nutrient content. Yes, I’m telling you that vegetables actually taste better AND are better for you when they are in season! Not convinced yet? Well, eating seasonally may also benefit your wallet because in-season produce are often more abundant and therefore cost less than out of season produce. 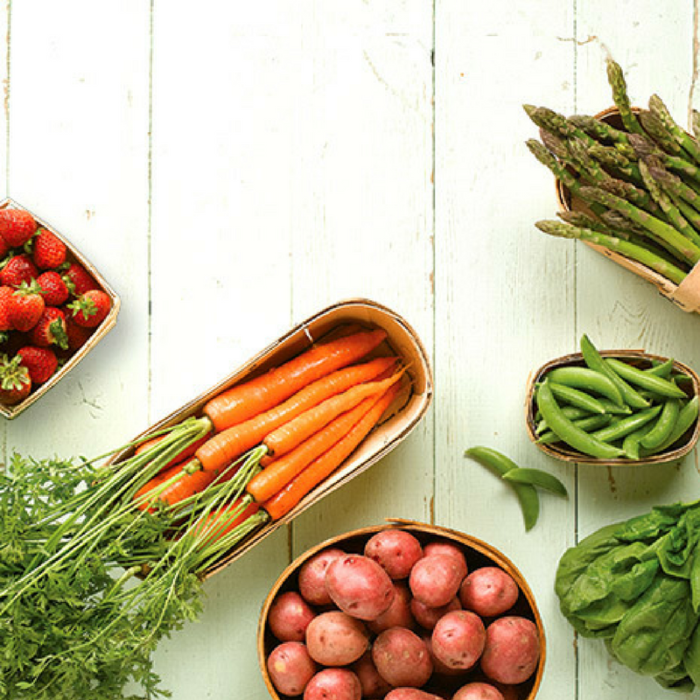 In-season foods are often grown locally, cutting down on the resources necessary to transport the food to you, lowering the cost and benefiting the environment. (Earth day is April 22 – and naturally Nicky has an Earth Day theme ride!) Check out a farmer’s market and support your local economy for some of the freshest produce you can possibly get. Farmer’s markets are the perfect way to directly connect with your local farmers and learn more about how and where your food was grown. The best time to try a new food is when it is in-season! Check out my list of seasonal produce for April and a few recipes from two of my favorite food bloggers. You just might surprise yourself with a new favorite fruit or vegetable!